Most mornings when I'm puttering around making breakfast in the kitchen, I bring up the Today Show page and watch their latest and most popular stories on the computer while I'm working. This morning I found it interesting that one of there top stories was the "thousands" of people that gathered for the gun control march in D.C. yesterday. The story today said "thousands" and the story yesterday said that "as many as five thousand people are expected." Okay...I thought (I bet you know where I'm going with this). 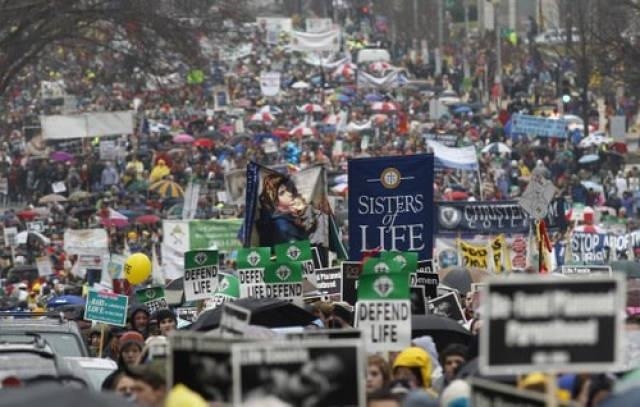 Surely they have a story here on the March for Life on Friday. I'm certain that they didn't altogether miss the 650,000 people that were stretched out over five blocks in D.C. just a couple of days earlier. 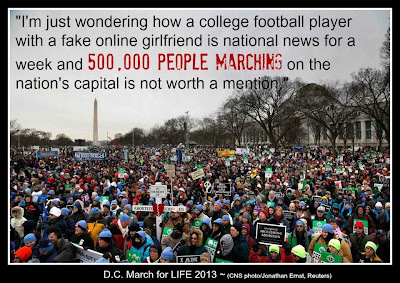 After all, if they're going to do two featured stories about five thousand people gathering in D.C., surely a story about over a half million marching to end abortion would have made it's way onto the site. I clicked around and found a story about a couple covering their floor with pennies (very cool looking, but maybe not quite as newsworthy as the gathering? ), and another story about a rare penguin in South America, but nothing on the March. But surely it was there, right? I used the search feature and put in March for Life. Apparently a picture made it into NBC's photo blog for the day (Wow! What coverage!). I decided to try searching "abortion." A few more stories came up. My personal favorite was "Abortion protestor climbs tree at inauguration, annoys revealers." Wait, so 650,000 people marching gets a single mention in an NBC blog post, but a man (described as a "known anti-abortion heckler" climbing a tree with a sign in a "brown Carhartt-style jacket" gets it's own national news story? NBC goes on to say that the crowd sang together: "Na Na Hey Hey Kiss Him Goodbye" as the police carted him off. Really? That gets a full article but not blocks of people peaceably speaking out over every child's right to his or her own life is hardly a blip on the network site? Good job main street media. It's hard to ignore something this huge so completely, but you did an awesome job. I didn't see a single story all weekend long. Don't worry though... we're not going away. Our numbers are significant and growing, since we aren't killing our children off one by one by one... and because truth doesn't just go away, even when you ignore it. And we're raising our children to know the truth, as one of the most popular books in our house at the moment says so well: "A life is a life no matter how small!" Sadie, who at the ripe old age of four and a half misses nothing, asked me on the day of the inauguration if we couldn't please tell the president that babies are babies when they're in their mommy's tummies so that he could help protect them... "We need to tell him..." she insisted passionately... 650,000 people did last Friday. Unfortunately it seems that he's hardened his heart on this issue and while he speaks eloquently about saving our children from guns, he doesn't seem to appreciate the sad irony of fighting for some of our children while advocating that others should be allowed to be killed throughout the first nine months of their lives. Well said - by you AND Sadie. How can we blind ourselves to such evil? I saw the March covered on the national news (CBS, I think) on Friday evening. They panned the crowd, talked about counter-protestors, and panned that crowd. You almost nailed my view of the president's thoughts on the matter. I think he's trying to keep our children safe from being killed by strangers. His view is: "Only a mother should have the right to kill her children." I watched specifically for coverage and NBC Nightly News with Brian Williams had a story, speaking of the "thousands" (more like hundreds of thousands) of people marching. There may have been other televised coverage, but I only watched NBC that evening. Several of the local TV stations, including my husband's, had stories on the 400 kids from the archdiocese (180 of them from our Catholic high school) who - as they do every year - rode buses up to the March. I went to numerous websites and most of them had a fairly long story which, I believe, originated with the AP. Of course, most of the national stories included the recent polls indicating that 70% of people do not want Roe v Wade overturned, or that the percentage of people who feel abortion should be legal in "all" or "most" circumstances has increased during the past year. Even Gallup has shown a change - and not for the better - during this past 6 months or so. I think that this past election season had an impact, with a couple of Republicans saying things they should have known would be used against them to make pro-lifers look Neanderthal. Also, there is speculation that Latinos and African-Americans, who voted Democratic in large numbers, have adopted the "values" and positions of the Democratic party, which -as we all know - is decidedly pro-abortion. I think that there is still plenty of work to do. As more and more young people identify with no religion, that will be a tough nut to crack. On the other hand, we all saw the numerous children, teens and young adults on the March; there is hope, and we have God, science and ultrasound pictures on our side. Darn!!! I had written a (length) dissection of this topic and got an error message!!! Our local stations covered it well; there are numerous buses from the archdiocese and our Catholic H.S. that go up every year and have for decades. Whether the "mainstream media" covers it or not, we have the "new media" at our disposal - Twitter, Facebook, blogs... We also have God and science in our corner, and the clear proof offered by ultrasounds. We will get there. It worked Marie! And it's good to know that it was out there somewhere (and total side note, I've been meaning to email you for the past week!). Hi Cam, I never post anything, but your comment about Obama and gun control reminded me of a promo ad I saw recently. It is from Blackstone Films. Did you get a chance to see it? If not here is the web address. I love how they use Obama's own words to prove how precious life really is. Just thought you might like it.